Once again I have been asked to review a website and share my thoughts with all of you. So, I’m going to be your personal tester, that way you don’t waste your time on a website or App that could be no good. What have they asked me to review? Great question! This time I have been asked to look over a website that boasts its professional poster maker service. I will be the judge of that! In my line of work I have been asked to design many things, including posters. Even my kids have asked me to help them create posters or flyers (tiny posters). So I pulled up a chair and dove right in to find out if this website could be something we all could use. Now, sit back and let me explain to you what this is all about. As you know, I like to break it down. Always a good question to start with before trying out any online design website. 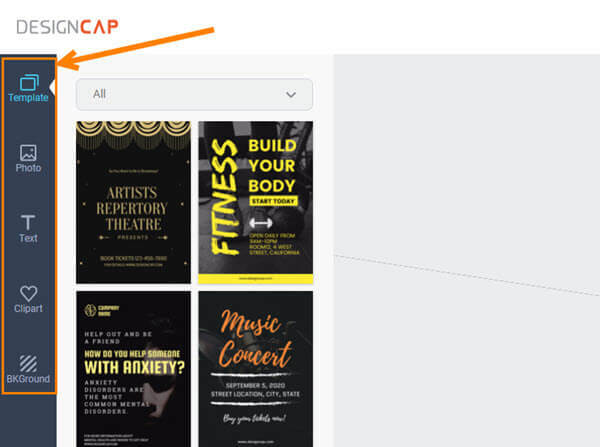 DesignCap is a free online custom poster creator. Yes, this is another free online tool that you can use to create some very cool posters for your band, church, Girl Scouts jamboree or any other event you wish to promote with a poster. The people behind DesignCap have nearly “…10 years of experience in graphic design and software development…”. They have hundreds of poster templates for you to choose from, which I find very helpful when you can’t think of where to start. So that highlights what they are. 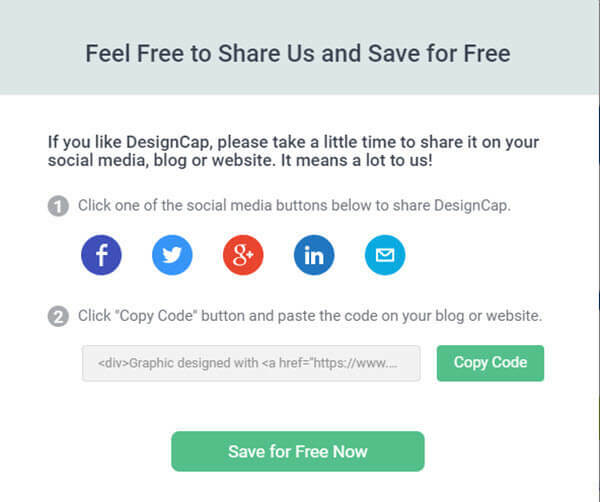 If you want to learn more about them, you can read this DesignCap About page. This is going to be a quick overview of how it works (this is not a How-To article). Once you are on their homepage it is very easy to get started. Right in front of you is a big orange button labelled, “Make a Free Poster”. By clicking that button you will be transported to the creation page. Here, they have laid it out in an easy-to-follow format. On the left, you have some options to choose from. Templates – There are many of these to choose from and have the added bonus of being able to customize them to your liking. Photos – I found this part to be one of the best features. You are able to add your own photos from your computer. A must if you want to create something of your own. The other part I like about this section is the ability to import your Facebook pictures. Text – They give you many styles to choose from, allowing you to add headings, sub-headings and body text. Clip-Art – With 93,000 different styles of Clip-Art to pick from, you are bound to find that right art. They are broken up into categories, or you can use the search feature to find the right one. Backgrounds – The background section I found to be very flexible. If you don’t find the background color you like, they give you an option to choose your own colors using an HTML Color Picker. There are other little features, but I want you to discover some of these on your own. Once you have finished messing around with all these options, you will be able to save it, print it, or share it. Now remember, this is a free service, so to be able to save, print or share you must share the Website on your social media, blog or website (a small price to pay). This should give you enough information to understand how it works. Overall, I found the flexibility of the site to be pretty good. Having worked with many design programs, this site really is on the top of my list. The option of being able to upload my own pictures is what sold me on this. Plus, you are able to pick a template and remove what you want and add what you want. Like any site of this type there are some limitations, but overall, the site performs well. So, the score for the flexibility part of the site is an “A”. TIP: On the issue of adjusting the poster size, I found that when you choose Print, and it offers you the print preview, you can look under more settings and change the scale option to 50 from 100. This changes the size of the poster to 8.5 x 11 paper size. At least that is the way it worked on my system. A solid choice for the do-it-yourselfer. It is easy to use and well worth the time needed to create a finished product. Check out their website at DesignCap and see exactly what they have to offer.